After hearing of the legendary treasure of King Nole, the elvish treasure hunter Nigel undertakes a quest to gather various pieces of the famed loot. Landstalker is an action RPG released in 1993. 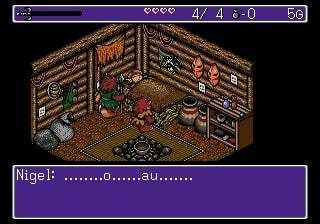 It's got an isometric view, something which is quite rare in games, and sounds a bit dated. So does it still hold up? In the game you are Nigel, a treasure hunter who rescues a fairy called Friday from a band of thugs trying to catch her. She tells Nigel of the legendary treasure of King Nole, so obviously he follows Friday’s directions to the treasure. 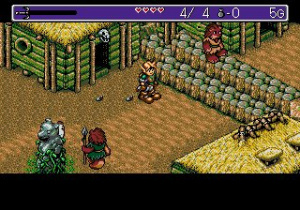 He instantly arrives at the location (as Friday knows it), but after activating a boulder trap, Nigel falls into a river and ends up in the lands outside the cave. 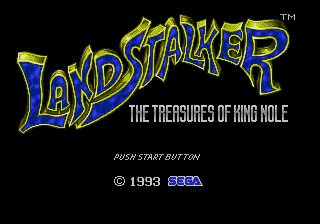 In a nearby village, he finds out that to reach King Nole's treasure, he must find various items held by people across the continent, which is where the game really begins. The gameplay is your standard RPG fare: run around, kill enemies, find upgrades, beat bosses and just make your way to the end of the game. Nothing special, really. The dungeons are well designed and have some smart puzzles, including some that make clever use of the isometric view. The final dungeon is a true masterpiece - The first time you go through it I guarantee you'll be stumped numerous times, and it will take you multiple hours. 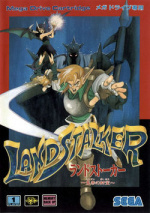 Battles are rather hard sometimes - Landstalker wastes no time throwing the tough monsters at you, as you encounter them almost right away (You will be surrounded in the first dungeon by three tough Orcs in a very small space), so save frequently and stock up on items! It is also suggested that you search the land thoroughly for Life Stocks, which increase your maximum life. There are about 75 total hidden in the game, and near the very end, you'll also find a shop that sells an unlimited supply of them. There's a variety of equipment in the game: the various swords have elemental powers which inflict extra damage upon certain monsters, and can be charged (By not swinging them for a bit) to unleash devastating attacks. New armour does nothing special besides, of course, protecting you more than armour previously found. You can also find a variety of boots, including ones that heal you when you walk or allow you to walk on fire. There are also rings that give Nigel some special abilities, such as immunity to poison. There are a small number of other, special items which will help ensure you find 100% of the locations and items, such as a bell that rings when Life Stocks are near, or a special stone that tells you how much of the game you've beaten. There's also non-mandatory special equipment which does stuff like increase your sword's charge rate. There are many secrets, so you'll have to look very hard to find everything! There's a nice variety of enemies, which each attack in their own unique way. Generic slimes just move around (though later ones are more erratic), mages teleport and shoot fireballs, and your standard ogres just run up and clobber you. Unfortunately, later on, you will see some palette swaps of older enemies, but this seems to be in every RPG game ever, so it's not much to worry about. The graphics are extremely nice - they are a bit weird and grainy, but everything is very nicely detailed and looks great once you get used to the unusual style. The isometric view can get a bit annoying at times though: nothing casts shadows, so it can be hard to tell where to jump! Thankfully, it won’t cost you your life (that is, if you don't keep your life low) if you do miss a jump, and you can usually get back up and try again quite easily. Most of the trickier jumps don't appear until later in the game, so you can practice up a bit earlier on and get an eye for how the developers generally positioned the platforms. It's also worth nothing that about 70% of the time, the platforms are on the same height (In dungeons anyway, outside they're usually on differing heights). The music's the only thing that's not much to write home about. There are some good tunes here and there, and for the most part, everything fits the area it plays in, but there's nothing really stand-out except for the game's overworld themes (of which the second one, which you hear later in the game, is absolutely fantastic). It's pretty much standard RPG stuff. Landstalker's a great, big game, and you'll certainly get your money's worth if you choose to buy it. A first-timer usually won't beat the game before 15, maybe 20 hours or so have passed, especially not if they're collecting stuff. This is one of the finest games in its genre (perhaps the best) and not one to be missed. Check it out: you will definitely not be disappointed. If you happened to own a PlayStation and the game Alundra, and you're thinking "Hey, this game looks similar", you don't know how right you are - Some of the people who worked on this game worked on Alundra. Landstalker was followed by a proper "sequel" for the SNES, called Ladystalker (Gotta love that title!) and instead having a female lead, although it was only released in Japan and wasn't quite as good. Nigel from Landstalker also made a few cameo appearances in some other games. Two years and not one comment... it looks great too. I'll have to try it out. Looks like a good game ill have to get this game some day. i gotta say this seems to be worth buying. The most underrated Action RPG of all time. Shame the game had one of the worst box arts in the whole Genesis library. It definitely is worth your time.